This article is about German political history. For the modern singer see Wende (singer). For the empress of Taizong in the Tang Dynasty see Empress Zhangsun. the under the President of the Soviet Union Mikhail Gorbachev possible Peaceful Revolution, a time of massive protest and demonstrations (Montagsdemonstrationen – "Monday demonstrations" and Alexanderplatz demonstration) against the political system of the GDR and for civil and human rights in the fall of 1989.
the fall of the Berlin Wall on 9 November 1989 following a press conference held by the Politbüro during which Günter Schabowski announced the opening of the border checkpoints. the transition to democracy in East Germany following the Peaceful Revolution, leading to the only really democratic elections to the Volkskammer in the GDR on 18 March 1990.
the process of German reunification leading to the Einigungsvertrag (Treaty of Unification) on 31 August 1990, the Treaty on the Final Settlement with Respect to Germany on 12 September 1990 and finally the joining of the five re-established East German Länder to the Federal Republic of Germany. 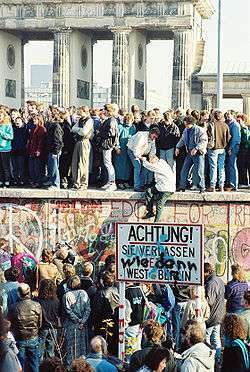 In hindsight, the German word Wende (meaning "The Turn") then took on a new meaning; the phrase seit der Wende, literally "since the change", means "since reunification" or "since the Wall fell". This period is marked by West German aid to East Germany, a total reaching an estimated $775 billion over 10 years. To some extent, Germany is still in the midst of the "Nachwendezeit" (post-Wende period): differences between East and West still exist, and a process of "inner reunification" is not yet finished. This fundamental change has marked the reunification of Germany. The term was first used publicly in East Germany on 18 October 1989 in a speech by interim GDR leader Egon Krenz (the term having been used on the cover of influential West German news magazine Der Spiegel two days previously). Whilst it initially referred to the end of the old East German government, die Wende has become synonymous with the fall of the Wall and of the East German state, and indeed of the entire Iron Curtain and Eastern Bloc state socialism. ↑ "Foundation Haus der Geschichte der Bundesrepublik Deutschland". Wikimedia Commons has media related to Die Wende.